Jennifer M. Brinkerhoff is Professor of Public Administration and International Affairs at the George Washington University. She holds a Ph.D. in public administration from the University of Southern California in Los Angeles, and a MPA from the Monterey Institute of International Studies. She teaches courses on public service, international development policy and administration, development management, and organizational behavior. She is particularly keen on encouraging people to pursue service careers thoughtfully, grounding their commitment to change in self-awareness and working in community. To that end, she and her husband, Derick W. Brinkerhoff, published Working for Change: Making a Career in International Public Service (Bloomfield, CT: Kumarian Press, 2005). Dr. Brinkerhoff has expertise on public-private partnership, governance, NGOs, development management, and diasporas. Her publications include six books, as well as three co-edited journal issues and over fifty articles and book chapters on topics ranging from evaluation, to NGOs; failed states; governance; and diaspora identity, development contributions, citizenship, and policy. She is the author of Digital Diasporas: Identity and Transnational Engagement (Cambridge University Press, 2009) and Partnership for International Development: Rhetoric or Results? (Lynne Rienner Publishers, 2002); the editor of Diasporas and Development: Exploring the Potential (Lynne Rienner Publishers, 2008); and co-editor of NGOs and the Millennium Development Goals: Citizen Action to Reduce Poverty (New York: Palgrave MacMillan, 2007). Dr. Brinkerhoff consults for multilateral development banks, bilateral assistance agencies, NGOs, and foundations. Her applied work encompasses partnership, civil society, institutional development, development management, and training methodologies, and includes work for the Ministry of Foreign Affairs, the Netherlands; and in Africa, China, Mongolia, Central Asia, and Russia for the U.S. Agency for International Development and the World Bank. She has provided policy advice to the US State Department on its diaspora engagement strategy and conducted diaspora-related commissioned research for the Asia Development Bank, the Migration Policy Institute, the Nordic Africa Institute, the United Nations, and the World Bank. She has also advised studies for the Africa Diaspora Policy Centre, the John D. and Catherine T. MacArthur Foundation, and the Organization for Economic Cooperation and Development. She has delivered training related to diasporas and development to US State Department Foreign Service and Desk Officers, US Agency for International Development staff, international development consulting firms, and diaspora organizations and other government officials in the US, the Netherlands, and Sweden. “Creating an Enabling Environment for Diasporas’ Participation in Homeland Development.” International Migration, Vol. 50, No. 1 (February 2012): 75-95. “Diasporas and Conflict Societies: Conflict Entrepreneurs, Competing Interests, or Contributors to Stability and Development?” Conflict, Security and Development, Vol. 11, No. 2 (May 2011): 115-143. “Public Private Partnerships: Perspectives on Purposes, Publicness, and Good Governance”(with Derick W. Brinkerhoff). Public Administration and Development, Vol. 31, No. 1 (February 2011): 2-14. Digital Diasporas: Identity and Transnational Engagement. New York: Cambridge University Press, 2009. NGOs and the Millennium Development Goals: Citizen Action to Reduce Poverty (co-edited with Stephen C. Smith and Hildy Teegen). New York: Palgrave MacMillan, 2007. “Partnership as a Means to Good Governance: Toward an Evaluation Framework.” In Pieter Glasbergen, Frank Biermann, Arthur Mol, eds. Partnerships, Governance and Sustainable Development: Reflections on Theory and Practice. Amsterdam: Edward Elgar Publishers, 2007: 68-89. Working for Change: Making a Career in International Public Service (co-authored with Derick W. Brinkerhoff). Bloomfield, CT: Kumarian Press, 2005. Partnership for International Development: Rhetoric or Results? Boulder, CO: Lynne Rienner Publishers, Inc., 2002. “Government-Nonprofit Partnership: A Defining Framework.” Public Administration and Development, Vol. 22, No. 1 (2002): 19-30. “Assessing and Improving Partnership Relationships and Outcomes: A Proposed Framework.” Evaluation and Program Planning, Vol. 25, No. 3 (August 2002): 215-231. “Government-Nonprofit Relations in Comparative Perspective: Evolution, Themes, and New Directions.” (Lead author with Derick W. Brinkerhoff). Public Administration and Development, Vol. 22, No. 1 (2002): 3-18. “International Development Management in a Globalized World.” (co-authored with Derick Brinkerhoff). Public Administration Review, Vol. 59, No. 4 (July/August 1999): 346-361. [Reprinted in Eric Otenyo and Nancy Lind (eds.). Comparative Public Administration: The Essential Readings. Amsterdam and Oxford: Elsevier Press, 2006: 831-862]. ForeWord Magazine Book of the Year 2005 Award Finalist, nonfiction category (for books that “expand a reader’s world, introduce a voice society needs to hear, or offer practical knowledge where none existed before”) for Working for Change: Making a Career in International Public Service (with Derick W. Brinkerhoff) (Kumarian Press, 2005). Independent Sector’s 2002 Virginia A. Hodgkinson Research Prize (first place) for “outstanding published research that furthers our understanding of philanthropy, voluntary action, nonprofits, and civil society in either the United States or abroad.” Awarded for co-edited journal symposium, “Government-Nonprofit Relations in Comparative Perspective,” Public Administration and Development, Vol. 22, No. 1, February 2002. American Red Cross Golden Bear Award for Exceptional Service, Field Service Territory 01, Region III – Western Operations, May 5, 1990. 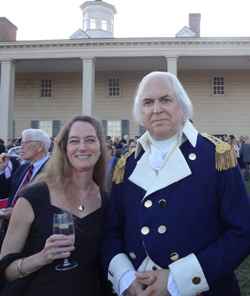 Professor Jennifer Brinkerhoff with General George Washington at Mount Vernon. On February 3, 2014, professor Jennifer Brinkerhoff of the George Washington University's Trachtenberg School of Public Policy and Public Administration presented "The In-Between Advantage: Diaspora Entrepreneurs & Institutional Reform, Lessons for Development and Management" at the Bush School of Government and Public Service and the Borlaug Institute at Texas A&M University. Professor Brinkerhoff's presentation has been added to the Bush School's YouTube page. View the presentation.